is a magical, empowering immersion into the immaculate, innate potential of you. You will learn the Art of High Vibration Living. It is all about knowing thyself, self care, self love and exploring the vital aspects of how our heart, mind, body, soul, and emotions are intertwined, and never separate from the whole. Scientific explorations in consciousness have revealed that there is life after life and that we can maintain a relationship with our loved ones and pets in the afterlife. High vibration living is not for the select few! Soul Summit Scottsdale will reveal scientifically validated strategies and tools to raise our vibration to the highest possibility of who we are! Click here for details & registration! Early Bird Pricing Available Now! 🌴 In this unforgettable weekend, Tina and Susanne will empower you to learn to trust your inner voice and strengthen your connection with your beloved people and pets who now live in the spirit world. 🌴 Tina Powers and Susanne Wilson are both scientifically authenticated evidential mediums and accomplished spiritual teachers. 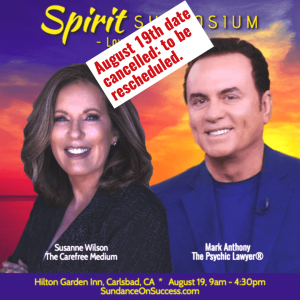 🌴 These two compassionate and gifted mediums have planned a dynamic and interactive weekend for you! You will have the opportunity to immediately practice as you learn new tools to increase your trust in your connection with spirit loved ones and your own inner wisdom. 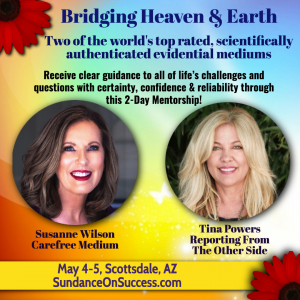 🌴 You will experience not just one, but two amazing and uplifting evidential mediumship demonstrations, one by Tina Powers and another by Susanne Wilson! *Although no one is guaranteed a message, if you pay close attention to all of the messages, you may find a golden gem that touches your heart. 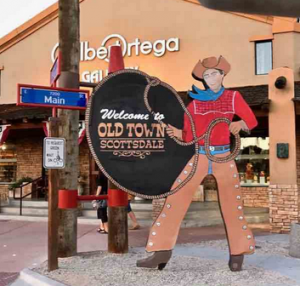 Visit Historic Old Town Scottsdale restaurants, shops, art galleries and beautiful sites! Enjoy your own innate vibrancy, love, passion, balance, transformation and knowing! 🌟 Read more about Susanne Wilson here! 🌟 Read more about Tina Powers here! 🌴 Morning coffee and tea are included! 🌴 There will be a 90-minute lunch break on both days. 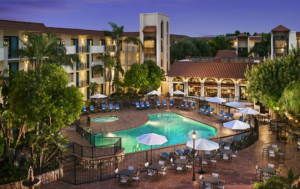 The hotel is located in the heart of Old Town Scottsdale where restaurants and shops are abundant. 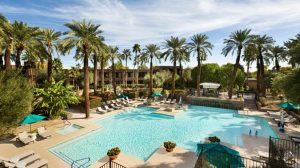 🌴 Enjoy discounted room rates at the Embassy Suites by Hilton Scottsdale Resort! Rooms are available at a potential discount when booked through the hotel website; subject to availability at the time of booking! 🌴 This special weekend will fill up quickly. Be sure to reserve your seat ASAP! 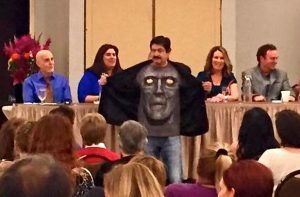 Exchange: $297: Includes two full days of Mediumship Mentoring with two scientifically authenticated Master Mediums! Questions? Please email Kathleen here! ▪ Sorry, there are no refunds or credits for cancellations after February 28th. However, you may transfer your seat to a friend or donate your seat to someone in need on our wait list, by speaking to Kathleen Malone in our office no less than 72 hours prior here 602.799.1617, or email here: Email. Join us at this gathering of open-minded seekers like you. AREI’s mission is to help humankind learn we are spiritual beings having a physical experience, we can communicate assuredly with loved ones in the next realm of life, there is no need to fear the normal life transition called death, and we should live together in peace, love, and joy. To achieve that mission, we are making available resources that will answer your questions about the afterlife, your loved ones living there, how to communicate with them, and what you can expect at your own transition. 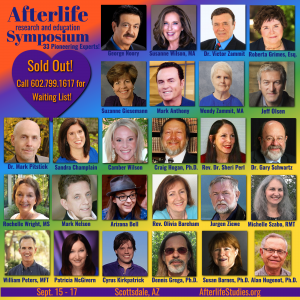 Take a look at our schedule here: 2018_Afterlife_Symposium_Schedule. Shopping is open to the public, Meet & Greet Happy Hours, also open to the public! One-Day Passes available ~ includes Banquet that evening! 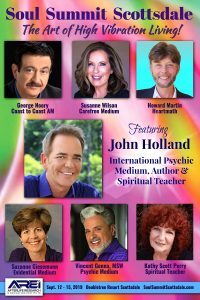 Featuring the foremost experts in afterlife communication, near death, reincarnation, healing grief, seances, private mediumship readings, the new spirituality, connection, wisdom, and fun! This is the largest, most comprehensive Afterlife and end-of-this-life gathering in the world. Learn what the dead want us to know about living. Make connections with loved ones and pets who have passed on. We’re teaching the latest in what we know about the afterlife, after death communications, the life review, what the dead want us to know about living, personal power, and how to transform yourself spiritually. 💜 Early Bird Pricing available until August 1, 2018. 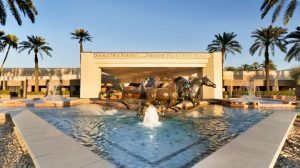 💜 New venue ~ the magnificent Doubletree Resort Scottsdale ~ we’ve negotiated super rates for you at this exclusive Scottsdale Resort. Overflow rooms are available at Embassy Suites Scottsdale and Hotel Adeline, both within 10 minutes walking distance! 💜 Make your reservations at the Doubletree Resort Scottsdale here! 💜 Questions? Contact Kathleen here! 💙 BE SEEN: We are also seeking vendors, sponsors and goodie bag items! Contact Kathleen for details here! 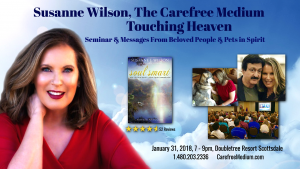 Susanne Wilson is rated one of the top mediums and spiritual teachers in the world! This is a rare opportunity to see Susanne in action. Susanne’s mediumship has been studied & endorsed by Dr. Gary Schwartz, Roberta Grimes & Victor Zammit. Susanne will explain signs from spirit loved ones & ways to make your own spirit connection. The majority of time will be spent giving messages from people & pets in spirit. No one is guaranteed a message, but pay close attention & you may find a gem that touches your heart! Doors open at 6pm: Artisan gift shop by Charles McAlpine, Storm Wisdom & Friends! 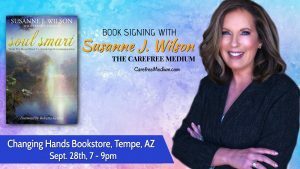 Susanne Wilson, The Carefree Medium is a world-renowned, evidential medium, spiritual teacher, and research medium who has participated in numerous scientific studies. Following controlled scientific research with Dr. Gary Schwartz, he states, “Susanne has been one of the best. 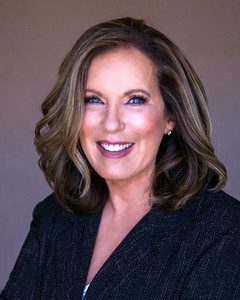 Her skills as an evidential medium are complimented by her high integrity, credibility, and moral principles.” Susanne serves on the Board of Directors for the Afterlife Research & Education Institute and is its director of Mediumship Research and Education, as well as an Advisory Board member for the SoulPhone Foundation. 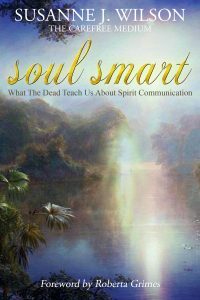 Susanne Wilson, The Carefree Medium, Presents her new book: Soul Smart ~ What The Dead Teach Us About Spirit Communications. She will also give several messages from spirit to attendees at random. No one is guaranteed a message at this FREE, group event. Susanne Wilson, a gifted medium, explains that you don’t have to “lose” your loved ones just because they transitioned to Heavenly home. Death is simply a change of address. You have your own unique team of guides, angels, and beloved people and pets in spirit who wish to speak with you, just as much as you wish to hear from them. Susanne has spent years documenting what the dead and higher-vibrational beings, including spirit guides and angels, have described about how they communicate with the living and what they need from us for good communication between our worlds. Soul Smart is a handbook of fresh tips and easy-to-follow steps that anyone, even a beginner, can use to connect with guides and loved ones in spirit. Now you can fully receive all of the love and support that is your birthright as a spiritual being who is living on Earth. Susanne is an author, evidential medium, intuition expert, and spiritual teacher. 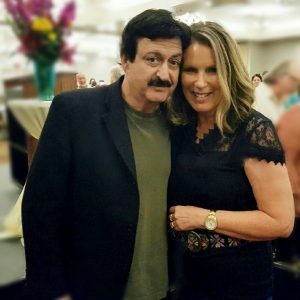 She has appeared on Beyond Belief with George Noory, Fox News, numerous radio and TV interviews, and international conferences. 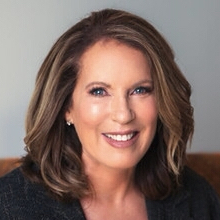 Susanne was born gifted, but hid in the “psychic closet” while working for most of her life as a corporate executive and university director. In 2007, her priorities shifted after she had a near-death experience. This brush with death changed her mind about what matters most, in life, and after life. She holds a master’s degree in public administration, a bachelor’s degree in management, and certifications in human resources, hypnotherapy, and Reiki master teacher. Her mission is to teach people how to make their own connections with spirit guides and loved ones in spirit. This assurance that we are never alone and we never die is very comforting to many people. Susanne is a tested and verified research medium. Susanne currently serves as board member for the Afterlife Research & Education Institute (AREI) as well as its director of mediumship research and education. In addition, Susanne serves on the Board of Advisors for the SoulPhone Foundation at the University of Arizona. Susanne lives in Carefree, Arizona with her husband of 30 years, Carl, and their two schnauzers, Baron and Bentley. 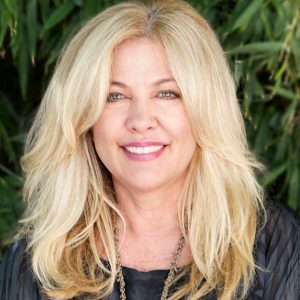 Susanne’s clients nicknamed her “The Carefree Medium.” Not only because she is based in Carefree, but also because she teaches people how to tap into their intuition to live a more carefree life. Meet Susanne at Warwick’s in La Jolla, August 27th, 12pm, 7812 Girard Ave, La Jolla, CA 92037. 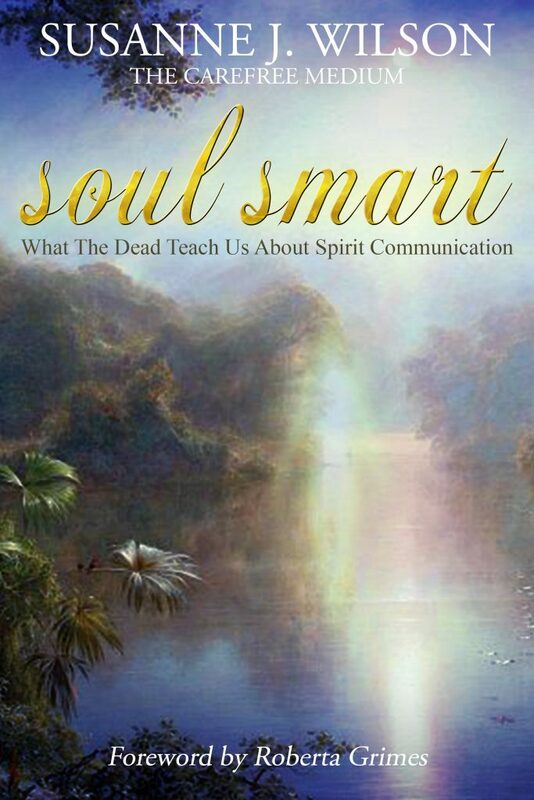 Susanne Wilson, The Carefree Medium Presents her new book: Soul Smart ~ What The Dead Teach Us About Spirit Communications. Meet Susanne at Barnes & Noble, August 19th, 2pm. 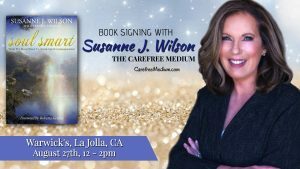 World-renowned spiritual medium Susanne Wilson, The Carefree Medium shares insights from her new best selling book Soul Smart, then conducts a Spirit Guides session and provides several validations from spirit guides, angels, and loved ones in spirit. There is no charge for this special book signing event ~ open seating! Susanne’s work has also been acclaimed by researchers Victor Zammit and Roberta Grimes. Susanne currently serves as a Board member for the Afterlife Research & Education Institute as well as its Director of Mediumship Research and Education. In addition, Susanne serves on the Board of Advisors for the SoulPhone Foundation at the University of Arizona. Please call 602.799.1617 to be wait-listed! 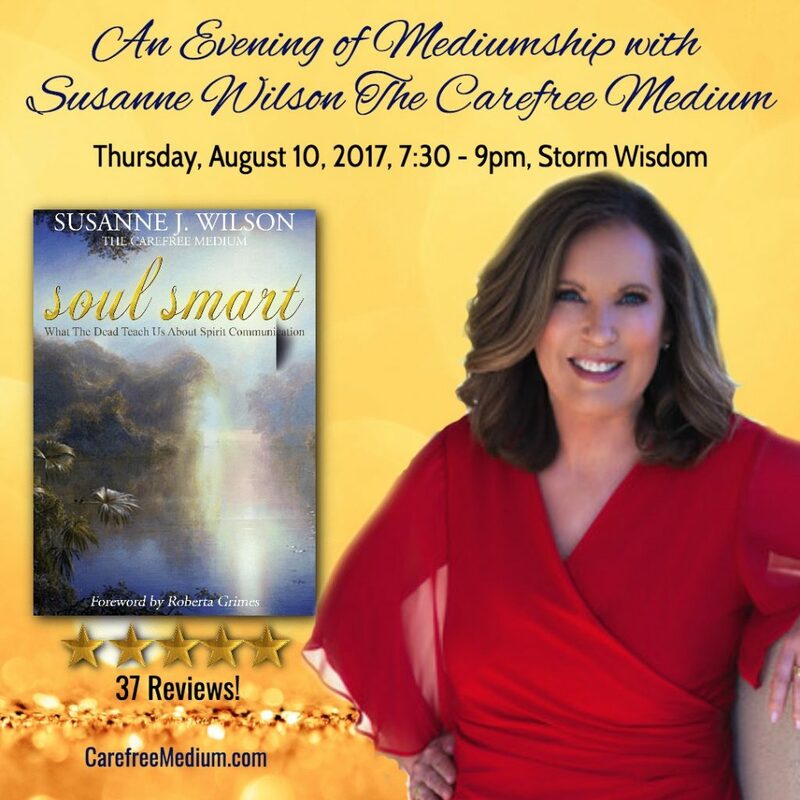 Join Susanne Wilson, the Carefree Medium for a group reading with only about 50 people. This is a rare opportunity to see Susanne in action. Susanne’s mediumship has been studied and endorsed by afterlife researchers Dr. Gary Schwartz, Roberta Grimes, and Victor Zammit. No one is guaranteed a message, but if you pay close attention, you may well find a gem that touches your heart. Book signing will be held afterwards! Exchange: $58 until July 25th, $68 thereafter. Purchase Susanne’s book in advance for $10, receive your book at the event! Susanne Wilson is an evidence-based medium and spiritual teacher. Born gifted, Susanne hid in the “psychic closet” while working as a corporate executive and university director, until a near death experience changed her mind about what matters most, in life, and after life. Susanne’s mission is to teach people how to make their own connections with guides and loved ones in spirit. She has participated in controlled scientific research with Dr. Gary Schwartz who states, “Susanne has been one of the best. Her skills as an evidential medium are complimented by her high integrity, credibility, and moral principles.” Susanne’s work has also been acclaimed by researchers Victor Zammit and Roberta Grimes. Susanne currently serves as a Board member for the Afterlife Research & Education Institute as well as its Director of Mediumship Research and Education. In addition, Susanne serves on the Board of Advisors for the SoulPhone Foundation at the University of Arizona. 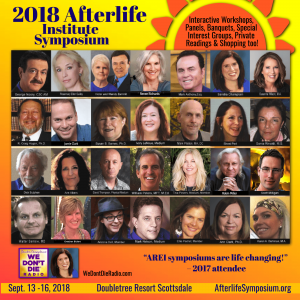 You’re invited to the largest Afterlife Symposium in the world and what promises to be the most revealing and exciting gathering ever of afterlife communication researchers, end-of-this-life experts, world’s top mediums, and educators about the new spirituality. 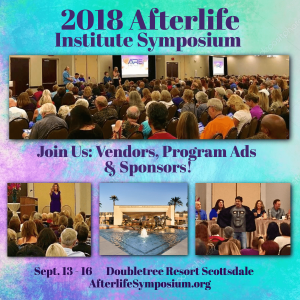 Together, we’ll explore not just the standard afterlife topics but also cutting-edge afterlife communications practices; the best methods for achieving rapid spiritual growth; new thinking about how best to manage the transition that is not really death; and what the dead tell us is the purpose of human life. 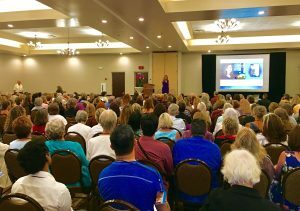 In addition to workshops, panels, banquets and mediumship readings, we have arranged optional “bucket-list” experiences including a tour to Sedona, tours of Old Phoenix, and hot air balloon rides. Make this symposium the start of something big in your life! Desire to learn how new ways of growing in love and compassion can make a difference for us as individuals and for humankind. Questions, contact Kathleen Malone, email or call, 602.799.1617. The world is full of talented people who can promote your products and services; Kathleen stands out with her genuine warmth, attention to detail and vibrant energy! Her enthusiasm is truly contagious. Kathleen's business has weathered the extremes of the American economy, and she still stands ready to serve. Once in a great while, you'll meet a person of outstanding character and integrity, Kathleen Malone is one of those rare gems. © Copyright 2017 Sundance on Success. All rights reserved.